Do polar bears and penguins live together? Do reindeer live at the North Pole? 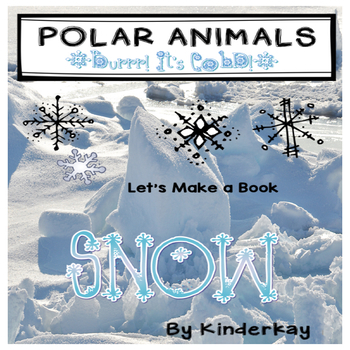 These questions are answered in this fun child-created book about the Polar Regions. Students use their beginning map skills to locate the Arctic Circle and Antarctica. 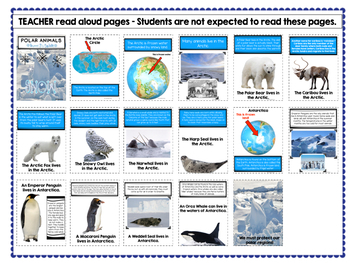 Easy to follow directions are included for how to cut paper to create a polar bear, an Arctic Fox, a Snowy Owl, a Narwhal, a Harp Seal, an Emperor Penguin, a Macaroni Penguin, an Orca Whale and a Weddell seal. This booklet is written in an easy reader format. Students illustrate the book themselves by using basic drawing and cutting skills. 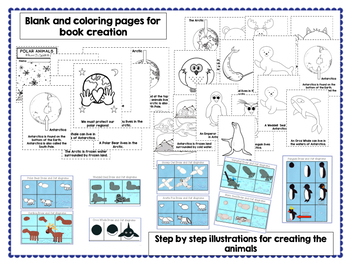 Step by step directions for how to create the animals are included. Black line drawings that can be colored are included as an option if you would rather have your students color their pages than create them from paper. Real life pictures are contained in this packet to aid students in their drawing as well as a full color book that can be laminated and used as a reference in the library corner. The pages can be put into a learning center for all students to complete, be a teacher directed activity, or used as enrichment for students who finish their assigned work early and need something fun and educational to do!